Benedict Timothy Carlton Cumberbatch CBE is an English actor who has performed in film, television, theatre and radio. The son of actors Timothy Carlton and Wanda Ventham, he graduated from the University of Manchester and continued his training at the London Academy of Music and Dramatic Art, obtaining a Master of Arts in Classical Acting. He first performed at the Open Air Theatre, Regent's Park in Shakespearean productions and made his West End debut portraying George Tesman in Richard Eyre's revival of Hedda Gabler in 2005. Since then he has starred in the Royal National Theatre productions After the Dance and Frankenstein . In 2015, he played William Shakespeare's Hamlet at the Barbican Theatre. Benedict Timothy Carlton Cumberbatch CBE (born 19 July 1976) is an English actor who has performed in film, television, theatre and radio. The son of actors Timothy Carlton and Wanda Ventham, he graduated from the University of Manchester and continued his training at the London Academy of Music and Dramatic Art, obtaining a Master of Arts in Classical Acting. He first performed at the Open Air Theatre, Regent's Park in Shakespearean productions and made his West End debut portraying George Tesman in Richard Eyre's revival of Hedda Gabler in 2005. Since then he has starred in the Royal National Theatre productions After the Dance (2010) and Frankenstein (2011). In 2015, he played William Shakespeare's Hamlet at the Barbican Theatre. Cumberbatch's television work includes appearances in Silent Witness (2002) and Fortysomething (2003) before playing Stephen Hawking in the television film Hawking in 2004. He has starred as Sherlock Holmes in the series Sherlock since 2010. He has also headlined Tom Stoppard's adaptation of Parade's End (2012) and The Hollow Crown: The Wars of the Roses (2016). In film, he has starred in Amazing Grace (2006) as William Pitt the Younger, Star Trek Into Darkness (2013) as Khan, 12 Years a Slave (2013) as William Prince Ford, The Fifth Estate (2013) as Julian Assange and The Imitation Game (2014) as Alan Turing. From 2012 to 2014, through voice and motion capture, he played the characters of Smaug and the Necromancer in The Hobbit film series. Since 2016, Cumberbatch portrays the Marvel Comics character Dr. Stephen Strange in the Marvel Cinematic Universe, first appearing in the film Doctor Strange (2016). 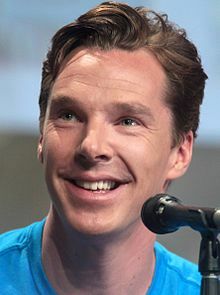 Cumberbatch has received numerous awards and nominations for acting including three Laurence Olivier Award nominations, winning Best Actor in a Play for Frankenstein. He has also received four Primetime Emmy Award nominations, winning Outstanding Lead Actor in a Miniseries or a Movie for Sherlock. His performance in The Imitation Game earned him an Academy Award nomination for Best Actor. In addition, he has received six BAFTA nominations, five Screen Actors Guild Award nominations and two Golden Globe Award nominations among others. In 2014, Time magazine included him in its annual Time 100 as one of the "Most Influential People in the World". He was appointed a CBE by Queen Elizabeth II in June 2015 for his services to the performing arts and to charity. Benedict Cumberbatch has never been in a horror film, and he may not want to be after getting a scare from his "Avengers: Infinity War" co-star "Iron Man."